Soda thief, it's time to meet your maker. 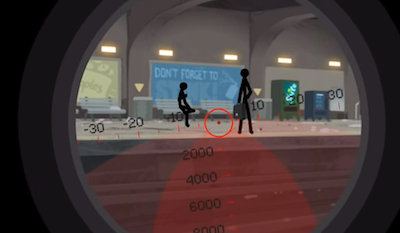 We've had a blast - literally - walking through the missions in the sniper game Clear Vision 3, where you take out stick figure targets for a big payday. For our latest round, we've got missions 21 through 25 covered. You'll have to deal with some real scumbags - including soda thieves! By this point, we recommend going with a good high-powered rifle, like the Lock n' Load Baby, to get the job done. It'll compensate well for greater distances, as well as accuracy and when the situation calls for it, wind. Someone in the subway system has resorted to stealing sodas! It's time to put the perpetrator out of business. When the mission starts, you'll find the target right in front of the vending machine, banging it like crazy. You won't have to worry about wind compensation down here, but with an older rifle, you might need to check for distance. Line up your target and fire away. Richard Cowen is a big jerk. He's one of the city's richest men, making his millions running factories in South America that are destroying the rainforest. It's time to shut him down. Mr. Fancy Pants will be sitting at a table at a rooftop restaurant, chatting with a friend. You'll be able to distinguish him clearly, as he's wearing a fancy Fedora. Line him up in your sights - adjust for distance with older guns - and don't worry about wind compensation. Once he's in your sights, take him out. However, DO NOT SHOOT ANYONE ELSE, or you'll lose some of your reward cash. You've hit the high profile, as the mayor of the city hired you to take out an opponent attempting to win over votes. You'll find the target at a podium, preparing for a public speech, surrounded by his aides. DO NOT HIT THE AIDES. 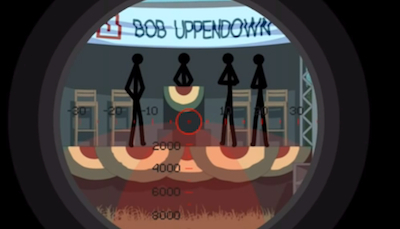 Instead, use your rifle to line up your sole target and pop one in his head while he's distracted. With a newer rifle, you won't have to worry much about distance. Older ones, however, may require a slight adjustment. Someone is giving your client a hard time at the office, so he asks you to quietly take him out on a sailboat with no witnesses. 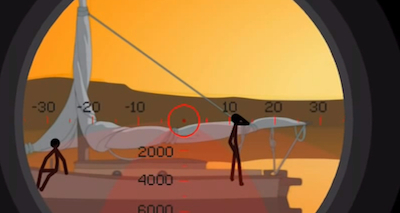 This makes your mission a bit more difficult, as this guy has a fellow person with him in the boat. Don't get fancy with anything on the boat, just start by shooting the target on the left (compensate for distance with newer rifles, otherwise a straight shot with a powerful one), then line up the slow-swimming guy on the right after he jumps into the water. It should be simple to pick him off, but make sure you do this before he swims out of your scope's distance. This is another dual-target mission you'll need to take care of quickly and conveniently. You're called upon to wipe out these targets so your client can move in on a very valuable shipment. One guy will be sitting in the truck, while the other surveys something just outside of it. 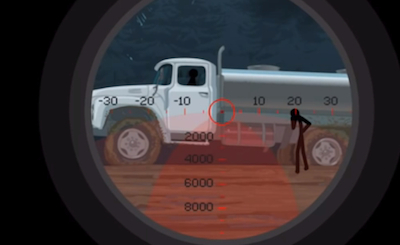 Go ahead and take care of the guy wandering around outside first - take your time and line up your shot carefully, since he moves around - and then, while the other guy is startled inside the truck, put a bullet in his head as well.